Estimates of the spatial extent of melt across the Greenland ice sheet (GrIS) were unexceptional for most of the summer (i.e., June, July, August) melt season of 2018. Surface ice mass balance for the 2017/18 season was below or near the long-term mean (relative to the period 1961-90), consistent with a snow cover that survived late into the spring and average/low surface melting during summer. Summer 2018 albedo (a measure of surface reflectivity), averaged over the whole ice sheet, tied with the record high set in 2000 for the 2000-18 period. Relatively high albedo was associated with the reduced surface melting and extended survival of the snow cover, which reduced the exposure of darker, bare ice. Surface air temperatures set new high records in winter (up to +14.4° C above the mean) and low records in summer (-46.3° C at Summit). The Greenland ice sheet plays a crucial role on our planet and in the Arctic. The high albedo (i.e., the fraction of incident solar radiation reflected by a surface) of the ice sheet contributes to modulating the amount of solar energy absorbed by the Earth and controls atmospheric circulation because of its location and topography. Moreover, Greenland represents a major contributor to current and projected sea level rise, through surface runoff and calving. Estimates of the spatial extent of melt across the Greenland ice sheet (GrIS) were unexceptional for most of summer melt season of 2018. Observations derived from brightness temperatures (a measure of a body's natural radiance) measured by the Special Sensor Microwave Imager/Sounder (SSMIS) passive microwave radiometer (e.g., Mote, 2007; Tedesco et al., 2013), indicated that melt extent exceeded (i.e., conditions were warmer) by one standard deviation in early June and again briefly in late July and early August (Fig. 1a). During the middle of the season, from mid-June to mid-July, the spatial extent of melting remained largely within the interquartile range of the 1981-2010 mean. The spatial extent of melt for the period of June, July, and August (JJA) 2018 was above average on only 26% of the summer days. During the same period of 2017, another low melt year, only 16% of days were above the average. Surface melt reached its maximum extent in 2018 (44%) on 31 July (Fig. 1a), compared to an average maximum extent of 39.8% (standard deviation of 14.9%) over the summer. Compared to previous summers, melt duration was within ±5 days of the mean for most of the ice sheet. There were notable exceptions in the southwest portion and along a thin margin in the northeast of the ice sheet, where melting was more frequent than the 1981-2010 mean (Fig. 1b) by more than 5 days. Fig. 1. a) SSMIS-derived surface melt area as a percentage of the ice sheet area during 2018 (solid red), in addition to the 1981-2010 average (dashed blue) and interdecile and interquartile ranges (shaded) b) melt anomaly (in number of melting days) with respect to the 1981-2010 period during the summer of 2018 estimated from spaceborne passive microwave observations. 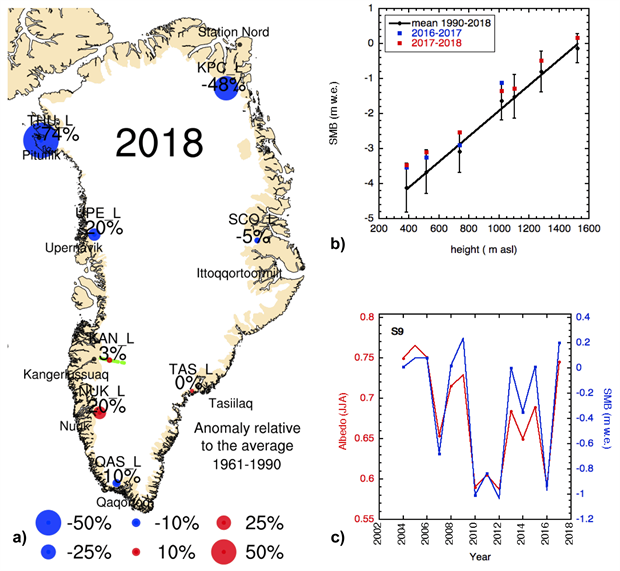 Net ice ablation (i.e., loss) in 2018, measured at 18 Program for Monitoring of the Greenland Ice Sheet (PROMICE, https://www.promice.dk/home.html) sites, was on average the lowest during the 2008-18 observational period (Fig. 2a). The southern and northern Greenland ice sheet margin (sites KPC: 79.91° N, 24.08° W; THU: 76.39° N, 68.26° W; and QAS: 61.03° N, 46.84° W) experienced the most negative anomalies (least ablation) spanning 1.3-1.9 standard deviations below the 2008-18 mean, while ablation at the other sites was within 1 standard deviation. The observed ablation values from the lower PROMICE stations, referenced to the 1961-90 climate-standard period, showed that anomalies at the KPC and THU sites were the most negative (least ablation), beyond methodological uncertainty (van As et al., 2016). Only two of eight sites (NUK: 64.48° N, 49.53° W and KAN: 67.12° N, 50.18° W) experienced above-average ablation, though not beyond methodological uncertainty. Fig. 2. a) Ablation anomalies for 2018 at lower ("L") PROMICE weather station sites over the Greenland ice sheet ablation area, referenced to the 1961-90 period following the approach by van As et al. (2016). b) The surface mass balance as a function of elevation along the K-transect (shown as a green line nearby the KAN_L station) for the period 2017-18 and the mean over the period 1990-2018. 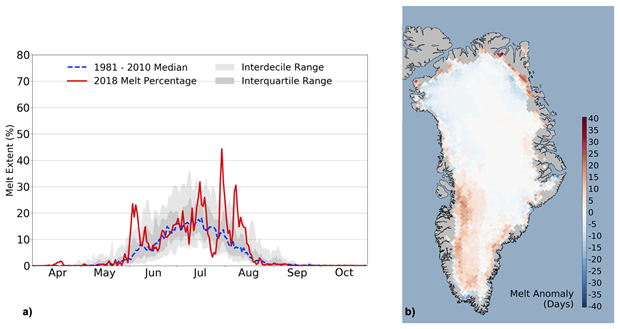 The error bars are the standard deviation over the period 1990-2018. c) Summer surface mass balance (blue) and albedo (red) at the S9 station (67° 03' N, 48° 13' W, ~1500 m above sea level) along the K-transect. The mass balance year 2017/18 along the K-transect (van de Wal et al., 2012) is characterized by moderate ablation over the entire ablation region (e.g., where net mass loss occurs). All sites show a surface mass balance within one standard deviation from the 1990-2018 mean, with a tendency of ablation being below the mean (Fig. 2b). The average surface mass balance over the K-transect for 2017/18 is nearly identical to the average over the season 2016/17. Overall, surface ice mass balance for the 2017/18 season was below or near the long-term mean (relative to the period 1961-90), consistent with a snow cover that survived late into the spring and average/low surface melting during summer. GRACE satellite data can be used to estimate monthly changes in the total mass of the Greenland ice sheet, as done in the past (e.g., Tedesco et al., 2017). However, the NASA GRACE mission, which started in 2002, ended in October 2017. Hence, there are no data available on the total mass balance for the 2017/18 season. The GRACE Follow On (GRACE-FO, https://gracefo.jpl.nasa.gov/) mission was launched on 22 May 2018. Data acquired since its launch are currently under review for quality control. The May 2018 launch means that no data are available from space between October 2017 and May 2018. Processing of the GRACE-FO dataset will provide estimates of total mass change anomalies for the summer of 2018 and will be calibrated to data acquired by GRACE. The summer (JJA) 2018 albedo averaged over the whole Greenland ice sheet was 81.7% (Fig. 3a), as estimated from the Moderate Resolution Imaging Spectroradiometer (MODIS; after Box et al., 2017). The 2018 summer albedo is tied with 2000 for the highest value recorded during the 19-year MODIS period of observation (i.e., 2000-18). The months of June and July had record high albedo. The high albedo anomalies along most of the coastline (Fig. 3b) are consistent with reduced melting in summer 2018, which resulted in late surviving snow over the darkest bare ice areas. The minimum average summer albedo was recorded in 2012 (76.8%), the year of record maximum melt extent. Albedos have been relatively high since 2012. Consistently with MODIS estimates, measurements at the S9 K-transect station show higher than usual albedo values (Fig. 2c), which are also strongly correlated with the surface mass balance values measured at the same location. In summary, summer 2018 albedo, averaged over the whole ice sheet, was relatively high for the 2000-18 period, matching the value of the record high set in 2000. Fig. 3. (a) Time series summer (JJA) albedo averaged over the entire ice sheet. (b) Map of the summer 2018 albedo anomaly relative to the 2000-2009 reference period. Measurements at 20 weather stations of the Danish Meteorological Institute (DMI, Cappelen, in prep.) indicate widespread above or near-average air temperatures for autumn 2017 and winter 2017/18, relative to the average for the period 1981-2010. Some record highs were set for winter and also in some individual winter months (Table 1). At Station Nord, the world's northernmost station, temperatures at Kap Morris Jesup were remarkably warm in February, reaching up to +14.4° C above the mean; an absolute temperature of +6.2° C was reached on 25 February. Spring 2018 was generally near average except in some places along eastern Greenland, where temperatures were above normal. Summer 2018 was generally colder or near average. A new record-breaking high temperature of +17° C was measured at Kap Morris Jesup on 3 August, surpassing the previous one of +15.4° C set on 5 August 1991. At Summit, the highest point on the ice cap, autumn 2018 was the third warmest, after 1993 and 2002. A new record-breaking cold temperature record, -46.3° C, was measured at Summit on 9 May, close to the previous one of -45.6° C set on 1 May. Table 1. Surface temperature anomalies [°C] and z-scores at twenty DMI stations for the periods of autumn 2017 (SON), winter (DJF) 2017-2018, spring (MAM) 2018 and summer (JJA) 2018. Station names, together with the year in which observations began and the corresponding coordinates are also reported, along with the years when maximum and minimum records were set. Highlighted text indicates the stations and periods when a new record was set. Consistent with net ablation observations and with DMI measurements, summer temperatures were below the 2008-18 average at all PROMICE sites by more than one standard deviation along the northern, north-western, and north-eastern slopes. July 2018 was the coldest in the 2008-18 period along the northern, north-western, and southern ice sheet ablation area. Out of all Jan-Aug 2018 station-months, 28% of monthly temperatures were more than one standard deviation below average, and only 3% were over one standard deviation above average. Marine-terminating glaciers are the outlets by which the Greenland ice sheet discharges ice mass to the ocean. When in balance, the rate of iceberg calving (by area) is balanced by the seaward ice flow. 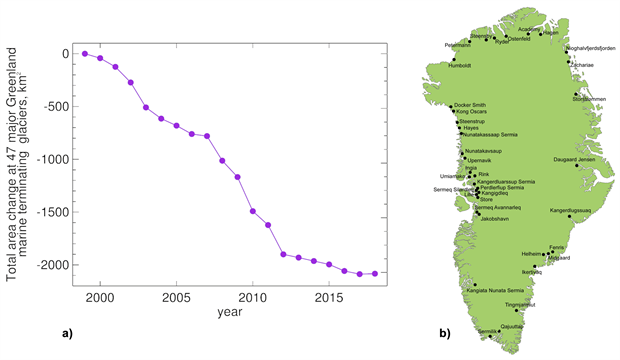 Glacier area measurements have been measured by Sentinel-2, LANDSAT and ASTER satellite imagery since 1999 (Box and Hansen, 2015). The 2017/18 net area change of the 47 surveyed glaciers, relative to the previous year, is +4.1 km2 and stands alone as the only year in the survey with an area gain (Fig. 4a). The next closely ranked year is 2006/07, when the net loss was -19.8 km2. The 2017/18 annual area change is 113.8 km2 less than the annual area loss per year averaged over the 19-year period of record (-109.7 km2 per year, 1999/2000 to 2017/18). Among the surveyed glaciers (Fig. 4b), 21 retreated and 12 advanced. The area changes at the remaining 14 glaciers were within ±0.2 km2. The largest single glacier area change in 2017/18 was an area loss at the Northwest Greenland Humboldt Glacier (-13.3 km2), followed by Kangerlussuaq Glacier (-8.1 km2) in East Greenland). Meanwhile, Petermann Glacier advanced (+19.1 km2), similar to the previous year (+11.5 km2). Greenland's largest ice producer, Jakobshavn Glacier, continued its retreat by losing a front area of 2.6 km2 relative to the previous year. Helheim Glacier advanced 10.6 km2. Fig. 4. a) Cumulative net area change (km2) at the 47 marine-terminating glaciers of the Greenland ice sheet (after Box and Hansen, 2015) b) Location of the marine-terminating glaciers used in this study. Box, J. E., and K. Hansen, 2015: Survey of Greenland glacier area changes. PROMICE Newsletter, 8, December 2015, http://promice.org/Newsletter.html. Box, J. E., D. van As, and K. Steffen, 2017: Greenland, Canadian and Icelandic land ice albedo grids (2000-2016). Geol. Surv. Den. Greenl. Bull., 38, 53-56. 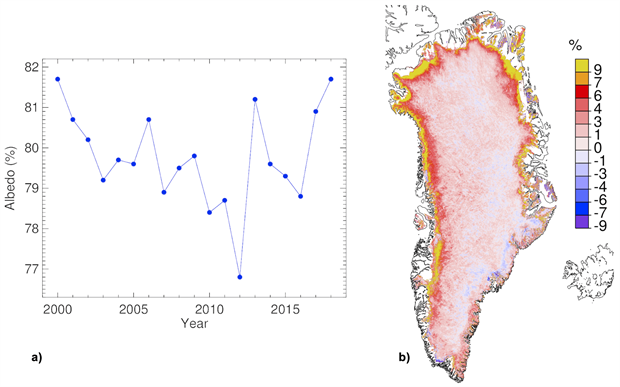 Mote, T., 2007: Greenland surface melt trends 1973-2007: Evidence of a large increase in 2007. Geophys. Res. Lett., 34, L22507. Nghiem, S. V., D. K. Hall, T. L. Mote, M. Tedesco, M. R. Albert, K. Keegan, C. A. Shuman, N. E. DiGirolamo, and G. Neumann, 2012: The extreme melt across the Greenland ice sheet in 2012. Geophys. Res. Lett., 39, L20502, doi: 10.1029/2012GL053611. Tedesco, M., X. Fettweis, T. Mote, J. Wahr, P. Alexander, J. Box, and B. Wouters, 2013: Evidence and analysis of 2012 Greenland records from spaceborne observations, a regional climate model and reanalysis data. Cryosphere, 7, 615-630. Tedesco, M., J. E. Box, J. Cappelen, R. S. Fausto; X. Fettweis, K. Hansen, T. Mote, I. Sasgen, C. J. P. P. Smeets, D. van As, R. S. W. van de Wal, and I. Velicogna, 2017: Greenland Ice Sheet [in Arctic Report Card 2017], https://www.arctic.noaa.gov/Report-Card. van As, D., R. S. Fausto, J. Cappelen, R. S. W. Van de Wal, R. J. Braithwaite, H. Machguth, and PROMICE project team, 2016: Placing Greenland ice sheet ablation measurements in a multi-decadal context. Geol. Surv. Den. Greenl. Bull., 35, 71-74.
van de Wal, R. S. W., W. Boot, C. J. P. P. Smeets, H. Snellen, M. R. van den Broeke, and J. Oerlemans, 2012: Twenty-one years of mass balance observations along the K-transect, West-Greenland. Earth Syst. Sci. Data, 4, 31-35, doi: 10.5194/essd-4-31-2012.